Is Mustard a Healthy Condiment? Mustard’s flavor makes it go well with various foods. Add it to your sandwiches, burgers, salads, meats, vegetable glaze, cheese dip, or any other food and you’ve got an extra mild kick to an everyday meal. Given its wide variety of flavors, it’s no surprise that it is one of the most popular condiments in the country, alongside the leagues of ketchup, mayonnaise, hot sauce, and barbeque sauce. But did you know that mustard, apart from its delicious flavor, also provides a wide variety of benefits? Sure, ketchup can provide you with the lycopene provided by tomatoes, but because of the multiple ways the mustard condiment is made, you get plenty of health benefits and nutrients. In that same vein, though, too much mustard every day and you could have long-term health risks from the excess amounts of ingredients and nutrients in that bottle of mustard. What Is the Mustard Condiment Made Of? There’s no one answer to this question because there are a wide variety of mustards, and it’s very easy to make your own at home. The main ingredient of “prepared” mustard is mustard seeds taken from a plant belonging to the Brassicaceae family. A basic mustard recipe involves water, vinegar, turmeric, and a couple of other spices. However, there are plenty of takes on the condiment. 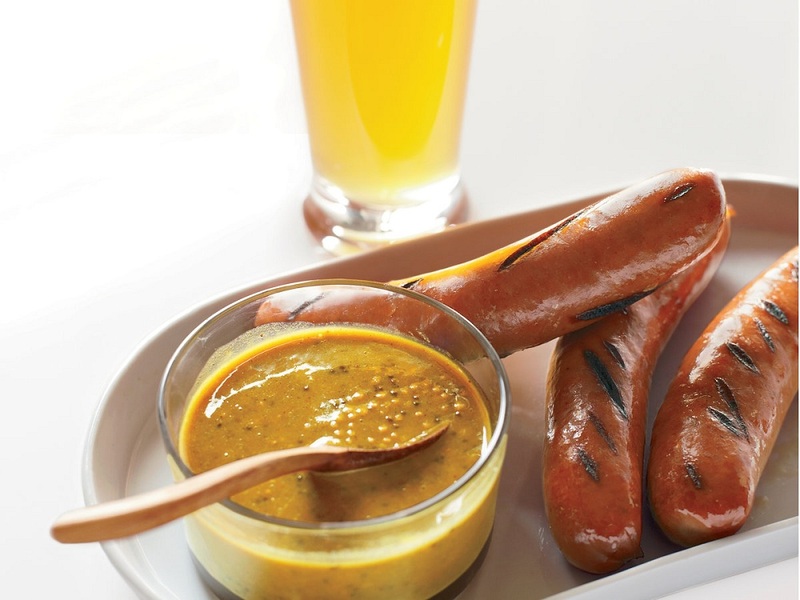 Bavarian sweet mustard is made with a spiced sweet vinegar solution using caramelized sugar, spices, berries, and black and brown mustard seeds. Dijon mustard is made with brown mustard seeds, white wine, and sometimes mayonnaise. Honey mustard has mayonnaise, honey, rice wine, and cayenne pepper. And these are just a few examples – check out Food Republic’s article to see just how comprehensive the list can get! Plenty of spices come from nutrient-filled plants, and mustard is one of them – even in its condiment form. 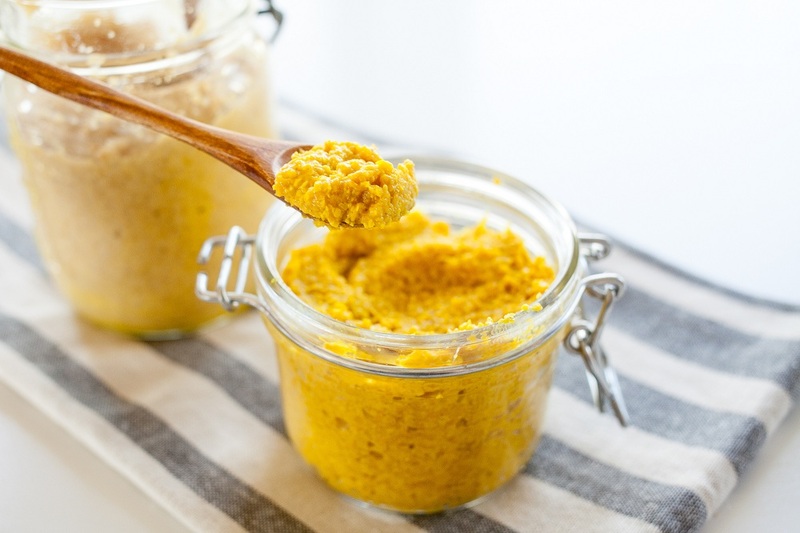 The seeds are actually packed with minerals, and while the process of making it and the other ingredients diluting the flavor can affect the healthiness of the mustard as a condiment, it still has a lot of important nutrients for your health. In 2005, researchers published a paper in Human & Experimental Toxicology looking at the effects mustard had on cancer – specifically, cervical cancer. They found strong evidence that mustard seeds had anti-carcinogen substances that could increase your body’s antioxidant immunity against carcinogens. Mustard has anti-inflammatory substances. When your brain thinks there are damaged cells, pathogens, or irritants in the body, inflammation is your body’s way to try to flush out these unwanted particles and heal. You may feel pain, redness in the inflamed area, swelling, and heat. However, sometimes your immune system may be wrong and triggers for no reason or does not return back to normal. Anti-inflammatory medication reduces the pain and other symptoms of inflammation, and mustard has natural substances that can do this. It’s particularly important for people with chronic inflammation, as keeping a diet with mustard helps keep these substances in the body. Mustard is also rich in copper and iron. Copper helps in making red blood cells, while iron creates the hemoglobin, which helps red blood cells go from the lungs to the rest of the body. Anemic people are encouraged to eat leafy green vegetables, seafood, and mustard seeds, all of which have high amounts of iron. What Happens If I Eat Too Much Mustard? These are all great benefits, but if you think eating a bucket of mustard is an alternative to actually seeing a doctor when you have to, you’re doing more harm to your body than good, even if mustard is a healthy condiment. You may not know it, but you might be allergic to mustard, but it is such a mild allergy that you don’t notice the inflammation because mustard condiments are diluted with liquids that decrease the potency of mustard seed. Even if you’re not allergic, too much mustard can leave mustard irritants inside your body. In worst case scenarios, you could have so many mustard irritants inside you that you could suffer from asphyxia, which is the same effect people with peanut allergies get if they eat peanuts. However, because mustard condiments have diluted mustard seeds, this is highly unlikely unless you’re the type of person to eat huge amounts of mustard every day. Mustard is high in sodium, phosphorus, calcium, magnesium, and selenium. In normal amounts, these can help you with your muscular, cardiovascular, skeletal, and nervous system. Sodium lowers your blood pressure and eases your muscle contractions. Phosphorus helps you heal broken tissue in your body. Calcium gives you stronger bones. Magnesium helps you mentally to sleep soundly. 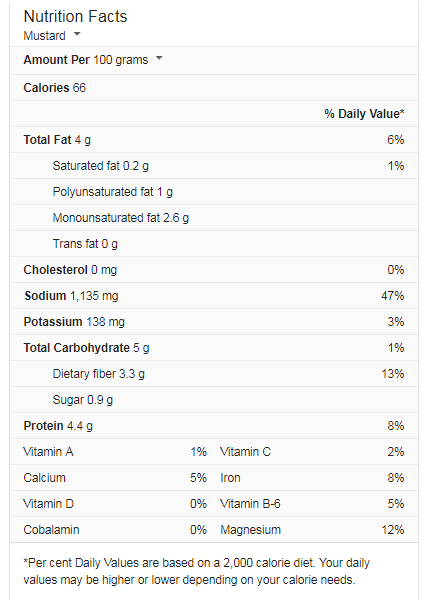 Too much, however, and you could actually be getting the opposite or extreme effects of these nutrients. Too much sodium leads to heart diseases. Phosphorus hardens your organs and tissue. Exposure to too much calcium will make your bones release most of its calcium, resulting in weaker bones. And too much magnesium can make it more difficult for you to breathe or concentrate. 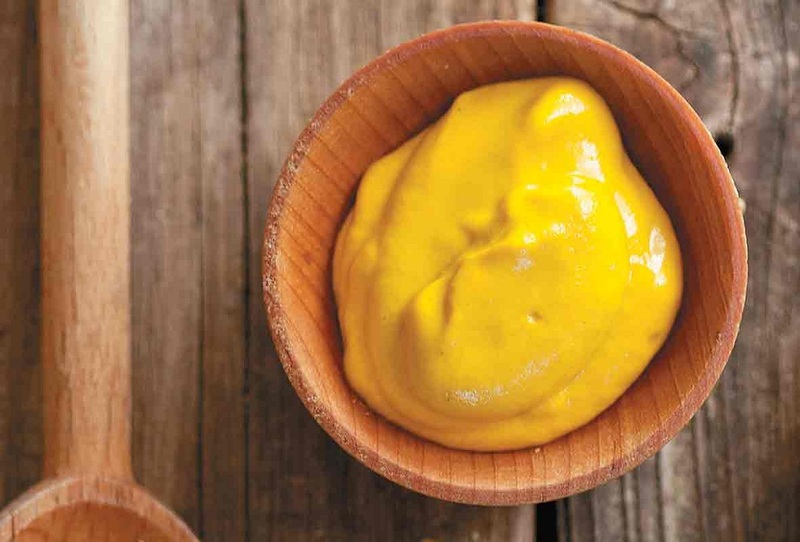 Like a lot of healthy plant-based condiments, mustard is a healthy source of nutrients and benefits, but it shouldn’t be a huge part of your daily diet. Mustard as a condiment means that it’s only a small fraction of your plate as a dressing, a dip, or a spread on your sandwich, so don’t expect it to be a superfood that cures anemia or cancer in a matter of days. What it can do, however, is provide small amounts of nutrients you might already be getting from your real food. And if you have a condition like anemia or poor sleeping quality, then these added nutrients to your meal can provide you with the health benefits. Just avoid taking too much, or else these benefits may turn into a risk that harms your health.